There is something beautiful about a simple black and white illustrations that bring a sweet story to life. That is how it wish All In A Day by Cynthia Rylant. This board book shares a positive message about enjoying the day. Illustrator Nikki McClure brings life to the story with old fashion scenery modernized with a splash of color. The book reminds me of some of my favorite classics and is quickly becoming a favorite in our story time. This lovely book illuminates all the possibilities a day offers—the opportunities and chances that won’t ever come again—and also delivers a gentle message of good stewardship of our planet. 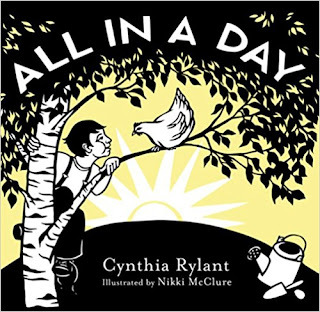 Newbery Medal winner Cynthia Rylant’s poetic text, alongside Nikki McClure’s stunning, meticulously crafted cut-paper art, makes this picture book not only timeless but appealing to all ages, from one to one hundred. You can get your copy at your local book retailer or online at stores like Amazon.